I went to the Stitches and Craft Fair on Wednesday for the day - After getting home at 12.30am from Madeliene's birth I rose again at 4.00am to catch the 6.00am flight. In hindsight I wished I hadn't been so tired but I am still glad that I went. It was quite an inspirational day. Here is the back view of Vintage Ric Rac's display of items. I took a front on shot but blogger won't play with me tonight so I 'll have to leave it until another day. Jodi's items were fabulous and expertly made. Her work is very inspirational and her site was lovely. Here are some of the things that I purchased including a 3 metre printed roll of ribbon for each of the grandkids which I will use in a project of some sort - Thomas & Maddie. Lots of "Shepherd" wool which I have some perfect patterns for. Rabbit ear pack of 7 fat quarters of "fun" fabrics. 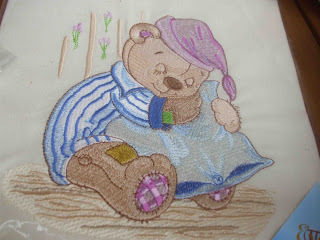 Some beading bits and an embroidered bear panel which I intend to use as a feature panel in a quilt for Maddie. It was a lovely day finished off with a spot of shopping at the DFO on the way back to the airport. I took lots of pics which I will add over the next week or two. It is raining at the moment and I am enjoy listening to it on our tin roof - I have stitched my Gail Pan BOM blocks tonight and will have show and tell tomorrow. 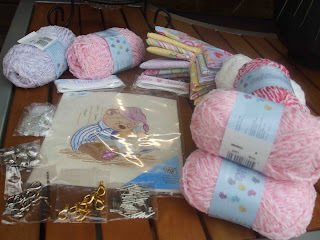 I am also in the home straight on the baby blanket that I am making for a friends grand daughter. Tomorrow will be a baking and ironing day with room for a visit to the hospital to visit with Maddie and then some stitching on some swap projects tomorrow night. Have a wonderful Sunday everyone and thanks again for all of the e-mails and messages. I will have an update on Maddie tomorrow. 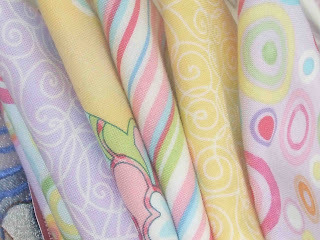 The fun fabrics look edible, they are so scrumptious. Fiona, your material look so nice and soft. Looks like you had a great day at the stitches and craft show. Im hoping to go to the one in July. Look forward to your creations with your new material. Your purchases look all warm and cuddly. 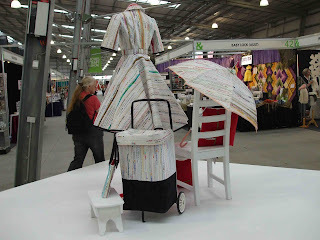 The Craft Show was great and Ric racs display was great. Thanks for stopping by. Tassie in the Spring .